Get up in the morning either without any teeth or with damaged and useless teeth and go to bed in the evening with new teeth – the ‘SKY fast & fixed’ dental treatment concept makes this possible. The patient receives new, individual, and fixed teeth with only one single visit to the dentist, in a single day. The procedure is suitable for people with single or multiple missing teeth through to a completely toothless jaw. Anyone who has already been battling against tooth decay and tooth loss knows from experience how time-consuming replacing damaged rows of teeth can be. At least four to six visits to the dentist’s practice are required over an extended period of time until all steps in the procedure from pulling teeth to final prosthesis have been completed. In addition, between the visits to the dentist, the patient must make do without fixed teeth and can hardly put any load on the unstable provisional prostheses. A new concept in treatment from implantology compromises these steps and makes a fixed dental implant also possible for patients with a poor prognosis, with only one visit to the dentist and without any pain during the treatment. In this way the patient not only saves time, but also gets around the unpleasant intermediate period without a stable row of teeth. Apart from this we can offer treatment under general anesthesia so that this is also possible for anxious patients without causing any problems. Firstly, the dentist removes the damaged remains of teeth. Next he cleans the bone which has been laid bare and the tooth sockets (alveoli) mechanically and using a special laser, and removes any inflammations should this prove necessary. The dentist now places the two-piece implant on the clean bone base. To do this he screws on the implant body made of biocompatible titanium which the body can tolerate, and replaces the root of the tooth, partially at an angle into the jaw bone. The implant abutment is installed onto this and serves as a connecting element for the final fixed row of teeth and as the basis for the subsequent impression. Building on the implant, he now takes an impression. Whilst a model is being made from this impression in the dental technician’s laboratory, the patients may allow themselves to rest in the relaxation room. Finally, the individually prepared row of teeth is screwed securely onto the new implants. Interested? Then make an appointment for a consultation. Who is ‘SKY fast & fixed’ treatment suitable for? 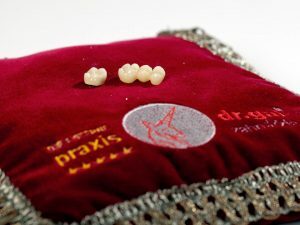 Even if the method can be used for individual teeth, this treatment concept above all is directed towards people aged 40 and older who are affected by a considerable tooth loss. The minimum requirement for treatment is completion of the bone growth, after reaching the age of 18. Thanks to an individual and detailed indication using the most up-to-date of equipment, the ‘SKY fast & fixed’ method also guarantees a safe treatment to high-risk patients, patients who are about to lose all their teeth, or those with an insufficient bone quantity as well as the toothless. The effective concentration of process steps enables patients to save an enormous amount of time. Instead of repeated trips to the dentist, they receive a fixed row of teeth on implants with only one visit to the surgery. The quality of this treatment concept has been proven in scientific studies. The high success quota can offer anxious patients security and thus help them to dispel their reservations and anxieties. Also patients with poor prognoses must no longer sleep next to their teeth, but can go to bed with their fixed teeth the very next night. Paying by instalments is possible in our practice. We even offer this service interest-free for 12 months. Just ask us about this and we shall be happy to discuss an individual financing concept with you. You can telephone to very easily arrange an appointment for a consultation with Dr. Gal in the 5-star practice on Tel: +49 (0) 7253 – 6324 oder or here via our website.